One busy Saturday afternoon I was patrolling the local mall parking lot in my police cruiser. It was warm, so I had my windows down enjoying the fall air. As I drove though the lot I heard a loud piercing cry echoing like a sound bite from a horror movie. At first I thought it was someone just playing around, and then I heard it again, and again. I began looking around the parking lot for someone being disemboweled because that was the sound I imagined would come with being ripped apart. Not knowing where it was coming from or what was happening; I called 911 on my radio and reported a “disturbance” in the parking lot. As I rounded the next corner I found the source of the commotion. There in the middle of the parking lot sat a full grown man with his socks and shoes off hitting himself in the face and screaming uncontrollably. Hovering over him was an elderly gentleman trying his best to collect the socks and shoes and get him on his feet again. The man sitting on the parking lot was much larger than the elderly gentleman and could not be budged. A confused crowd was forming around the two and at first sight I thought it was a horrible fight between two grown men. I notified 911 with my location and turned on my overhead emergency lights as I rolled up to the scene. Not until I got closer did I figure out what was going on. The man on the ground was very obviously disabled and the elderly man was his father. I immediately cleared the crowd and asked the father if he needed any assistance. The elderly father explained to me that he had picked his son up for a day visit from the group home where he lived. “I knew better than to go at it alone, but sometimes he does really well. I wanted to spend some time with him so I brought him to the mall. He was fine until we got to the parking lot. When he gets upset he takes off his socks and shoes in protest.” said the father. “His name is Donald”. Donald was about 6’3” and weighed about 220 pounds. He was in his mid 30’s with a rough complexion and many self-inflicted battle scars. His emotions seemed to calm slightly when I arrived at the scene, but his face was still contorted with anxiety as he fumbled with his socks. Donald looked like he could handle himself—along with his father and me. I knelt down to his eye level (even though he would not make eye contact) and said, “What’s going on buddy?” Again, the father began nervously explaining to me what was wrong with his son. I stood up and listened intently but all I could focus on was the hopeless defeat that saturated this man’s weary eyes and exhausted expression. “I’m getting too old for this” the man said with a broken voice. I was guessing he was probably in his mid to late 60’s but looked to be 80. He was tall, thin, and frail with white balding hair, wearing a dark flannel shirt and blue jeans. He looked like an old farmer who had come to town in his pickup truck to get some supplies. “I’m so tired.” He said as he turned away for a moment. I knelt back down on Donald’s level and picked up his shoes and socks. I wasn’t sure how he would react to me invading his space and I fully expected to be kicked or punched by this large, confused man. I slowly unballed his sock and began putting it back on his foot. He extended his leg in a sort of surrender to let me know that he would comply. I rolled the sock gently over his toes to his heal and then up to his ankle. His pale, crooked feet felt cold and damp and his long sharp toenails were in need of a trim. Probably true to his age-old routine, he extended the other foot for me to do the same. Once I got both socks on, I unlaced his large tennis shoes and one by one slipped them onto his feet. I then cinched them up and gave them a double tie like I had done for my own son so many times before. After getting Donald ready to get back on his feet again, (in a strategic attempt to gain leverage) I asked the father what Donald really liked. “Chicken nuggets and coffee” he replied. I turned back to Donald and asked, “How would you like your dad to take you to get some chicken nuggets and coffee buddy?” He gave a silent nod of approval and we helped him off the ground and into the truck. After getting Donald buckled in the front seat, the elderly father returned to his side of the truck with a simple expression of gratitude. He shook my hand in appreciation and said “Thanks” in a broken tone drained by the emotion of the moment. I shot back with, “No problem, I do this for a living.” We both smiled with a strong connection as I gave him a pat on the shoulder opening the driver’s side door for him to get in. I knew from experience that he wasn’t thanking me for helping him or his son as much as he was being grateful for receiving empathy instead of sympathy. Sometimes just being aware that someone else knows—I mean really knows—what you are going through is enough to bring great comfort in the midst of great despair. As the two men drove off the parking lot in the old pick up truck I watched as the weary dad lifted his arm and placed it around the shoulder of his son. A prodigal never finds love so satisfying and sweet as he finds it in the unconditional arms of his father. 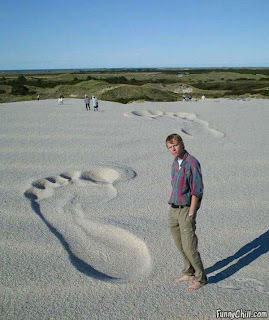 there has only been one set of footprints in the sand. Who hasn’t been moved by those touching words from the poem “Footprints in the Sand”? Just to know that, even when we don’t realize it, God is going to be there in the difficult times and He carries us through the most trying times. So whether there are two sets of footprints or one set of footprints, God is faithful to deliver. But what happens when there are no footprints? Just recently, during a particularly troubling day, I came across Psalm 77, a sort of biblical version of “Footprints in the Sand” I guess. The Psalmist begins the poem in anguish, “I cry aloud to God…In the day of my trouble I seek the Lord”. He goes on to talk about sleepless nights, waning faith, being spurned by the Lord and the inability to see His steadfast love or find His compassionate care. So far so good--that's right where I'm at today. How can the Psalmist know that the Lord will hear him? How can he know that God will be with him during this anguish? How can he know that God will carry him if need be? How can you and I know? Instead of looking around at his own circumstances and trying to formulate a theology of God based on situational emotion, the Psalmist searches the archives and checks God’s record of faithfulness. No calm beach, no pristine sunset, no gentle lapping waves, no peaceful puffy white clouds and no footprints—not two sets—not even one set. 1. When I cannot see God's faithfulness in my immediate circumstances I have an archive of His faithfulness to look back on. His record is spotless, His faithfulness is perfect. My response: Therefore, I will not be swayed by emotion or fall into despair. Instead, I will run to His word, the Bible, for my source of strength and assurance. 2. God generally prefers to take us through the stormy sea rather than around it or beside it. It reveals more of my helplessness and more of His glory; more of my dependence and more of His strength. It also prepares me with a stronger testimony of His deliverance to share with others. My response: Therefore, I will tell the stories of His miraculous deliverance to spread the fame of His name to a fallen world. 3. The absence of footprints does not mean God was missing during my trials or that He didn’t carry me. It only means that He is so much greater than all my obstacles, all my problems, all my circumstances that He can carry it all and not leave a single footprint. My response: Therefore, I will not look for footprints in the sand. Instead I will look back at His perfect and spotless record of faithfulness in my life and the lives of others and realize, that is the biggest "footprint" of all. Someone recently asked me how I deal with people who stare at my disabled son in public? Truth is, every time I venture out into public with Jake I am essentially inviting the world to see a little of God’s grace in the raising of my son. I try to maintain that attitude when looks become stares. What bothers me most is that behind every stare is a thought, perhaps a question that needs answered or a statement that needs to be clarified. As the parent of a special needs child, I have learned to sometimes (not all times) interpret the stares and decipher the thoughts. I have also formulated some responses to these stares--other than the initial, internal, emotional, rhetorical response of, "What are you looking at?" Take for instance a recent trip to a crowded shopping mall where, without warning, Jake got mad and threw a box of candy (which contained about 500 or so Jelly Belly jelly beans—his favorite snack). As the box hit the tile floor of the mall, it exploded like a hand grenade, shooting sugary projectiles for 25 feet in all directions. People froze as if they had suddenly wondered onto an unmarked mine field. Then, like spectators at the scene of a bad car wreck, every eye in the mall zoomed in on my screaming, disabled son as my wife and other children scrambled to clean up the mess. Response: You would what? You’re right, someone does need to get this child under control. Do you have any ideas? Really? Enlighten us all with your parenting secrets. Response: Why don't you start by helping my wife and kids pick up the Jelly Bellys. We are weary. Thank you for noticing (and that is a sincere thank you). What’s more important is the source of our strength. Your compassion is always welcome. Pray for us, but do not pity us. There are greater things happening here than any of us realize. And if you really want to do something skip down to stare #6. Response: I’ll write a book on it someday. Meanwhile, come and ask. (Preferably not right in the middle of an episode though or I might emotionally vomit out, "What's wrong with him? What's wrong with you!") When things settle down, I’d love to share our story with you. I especially don’t mind if you are a small child or young person. Response: Yeah, I saw you. It’s ok. I’ve been in the same position before, not knowing what to do. Thanks for the smile. Here’s one back at you. Response: A kid just threw 500 jelly beans down on the mall floor. You didn’t notice? Are you kidding me? Response: It’s heartbreaking sometimes, but it has its amazing moments too. Go home and pass ball with your kids. Squeeze them tight. Take a long walk, have a long talk, and thank God for them. But don’t forget that there are others out there that might need your help too. Get involved, volunteer, mentor, pray, educate and most importantly learn…these kids have much to teach. I’m sure there are many more stares to interpret and many more responses to be communicated by special needs kids and parents everywhere. The bottom line is this: the next time you’re in the mall and a Jelly Belly grenade goes off, be cool. Its ok to look...just stop and help us pick the darn things up. Today I’d like you to meet another one of my heroes—my wife, Kim. That's her hiding in the middle of the picture, surrounded by some of her greatest accomplishments. She’s a transport/flight nurse in the NICU at our local hospital. She saves lives every time she goes to work. But that’s only part of the reason she’s one of my greatest heroes. Kim is also the driving force in our family when it comes to making sure that Jake (and the other kids) get exactly what they need, to be all they can possibly be. I sometimes write my blog like I’m on this journey alone. Truth is I stand on the shoulders of my wife as I tell the adventures and lessons of raising our son. I am the voice of this story; she is the heart and soul. Kim is Jake’s greatest defender this side of heaven. She is the determined ambassador for his good, the skilled advocate for his rights, and the tenacious maintainer of his joy. Teachers respect her, parents listen to her, and young interns sometimes fear her. But in the end all come to know and love her as Jake’s mom, the woman who would give her last breath to make sure her son is cared for in the best possible way. So today I bow in love and respect to this great, godly lady who would prefer to stay backstage where the unseen work is to be done, rather than take the spotlight where the story is told and the accolades are given. And like most men who appear to say and do great things, the unseen strength and beauty of our stories will always be found in the humble fortitude of the great women who walked beside us.